Lebanese Forces leader and presidential candidate Samir Geagea challenged his political rival FPM leader MP Michel Aoun to run against him or move on to plan B which calls for agreeing on a consensual candidate , Lebanese media reports on Thursday. Plan B has always been in the works according to observers since none of the four leading Maronite politicians – Aoun, Geagea, Phalange party leader Amine Gemayel and Marada Movement leader Suleiman Frangieh were ever considered serious candidates because they are too partisan to be elected, since they represent either the March 14 or March 8 camp. 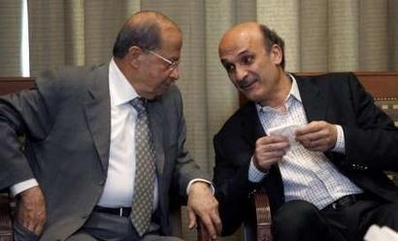 “And if Aoun wins (the presidential race), I will be the first person to congratulate him,” Geagea was quoted as saying. The Institutions talks will conclude with a meeting with Patriarch Beshara al-Rai following his return from his visit to Jerusalem. This development is taking place after the parliament failed for the fifth time in a row to elect a new head of state to replace former president Michel Suleiman whose term ended last weekend. 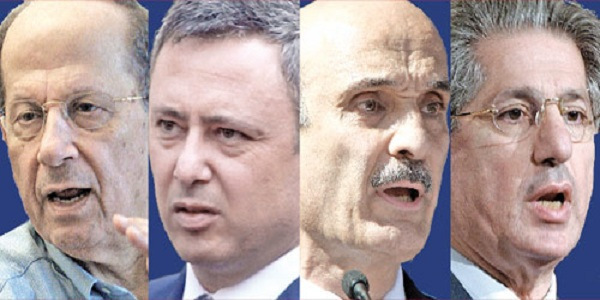 While The March 14 alliance continued to support Geagea who was the first to announce his candidacy with a workable program , March 8 rejected his candidacy without officially declaring which candidate they are willing to support. Aoun however has been saying that he will only run as a consensus candidate. Geagea secured 48 votes out of the parliament 128 in the first round. March 8 decided to boycott the sessions that followed which prevented the achievement of a a quorum . One analyst told Ya Libnan last Tuesday: “Even Hezbollah does not want Aoun as a president but has been telling him , go get Future’s votes and will back you, knowing very well that Future Movement leader and former PM Saad Hariri will never consider Aoun a consensus candidate .Hezbollah according to the analysts wants army chief Jean Kahwaji (with whom the party enjoys excellent relationship) as the next president, but they are aware that their ally Aoun is dead against his candidacy .